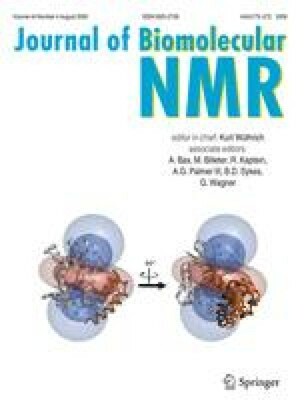 NMR chemical shifts in proteins depend strongly on local structure. The program TALOS establishes an empirical relation between 13C, 15N and 1H chemical shifts and backbone torsion angles ϕ and ψ (Cornilescu et al. J Biomol NMR 13 289–302, 1999). Extension of the original 20-protein database to 200 proteins increased the fraction of residues for which backbone angles could be predicted from 65 to 74%, while reducing the error rate from 3 to 2.5%. Addition of a two-layer neural network filter to the database fragment selection process forms the basis for a new program, TALOS+, which further enhances the prediction rate to 88.5%, without increasing the error rate. Excluding the 2.5% of residues for which TALOS+ makes predictions that strongly differ from those observed in the crystalline state, the accuracy of predicted ϕ and ψ angles, equals ±13°. Large discrepancies between predictions and crystal structures are primarily limited to loop regions, and for the few cases where multiple X-ray structures are available such residues are often found in different states in the different structures. The TALOS+ output includes predictions for individual residues with missing chemical shifts, and the neural network component of the program also predicts secondary structure with good accuracy. The online version of this article (doi: 10.1007/s10858-009-9333-z) contains supplementary material, which is available to authorized users.